We began our trip to carnival at northwest. A photo-travel to live from within, along with the locals, one of the most important, a real, traditional festival of the Northwest Argentina. An Andean celebration, full of native root’s rituals and ceremonies. In the old days it was called Capac Raymi, the festivity of the crop Season . After Spanish conquerors , it was mixed with European Carnival It became then, sincretic feast, where the devil is the figure that represents it. This devil or Pujllay, as they call him, awakes from his long sleep and enables people to get rid of their negative aspects that were repressed during the year. Some rituals are repeated every year. The Desentierro (Unburial) is an example; it gives start to the Carnaval Grande (Big Carnival). After Ash Wednesday the festival goes on with the Carnaval Chico (Small Carnival) and finishes with Entierro del Carnaval (Carnival’s Burial). This burial symbolizes repentance and the end of the frenzy. 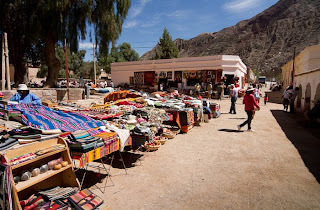 The people from Humahuaca Ravine invoke Pachamama (Mother Earth) with food and drink offerings so that she allows Carnival to come out her entrails. They ask Mother Earth for joy. They form circles and dance, they throw people talc and wear garland of flowers and colourful papers. 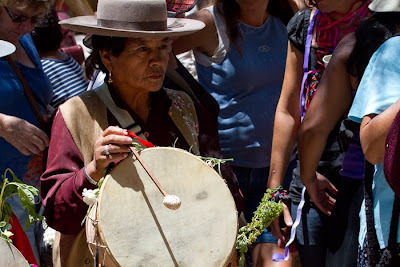 They carry basil's sprigs at their Cajas, behind their ears, as one of the symbols of the festivity. 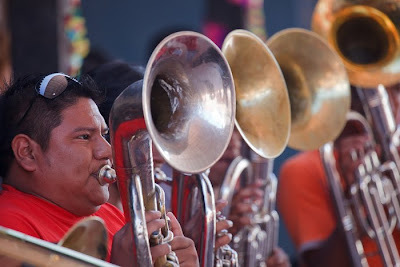 Before going to see these comadres we met some members of one of the groups that will be present when carnival be unburied next Saturday.. a band of musicians practicing at a big open saloon. Coplas are simple phrases, singed from the heart to express sorrows, love.. to just describe life in all aspects.. voices go direct as an arrow to the heart of the spectator, even not knowing what words mean.... after a brief introduction of a man playing the erquencho, you will see “Las comadres”..
At the village, we assisted to a special feast, Fiesta de la chicha y la copla. A festivity where the locals show their ability to prepare that beverage and where we tried , also, all kind of typical, regional meals. Tamales, Empanadas, Picante de pollo. On a stage, copleras from all places of la Quebrada and other provinces arrived and sang; single, duos or trios in counterpoint. Simple words,..about life and eath, about picaresque love .. the whole universe of La Quebrada, resumed in their verses. After the copleros, all people began to dance. Zambas, carnavalitos (a popular dance of inca origin), and other typical rhythms, were played by musicians with guitars and bombos.. In the late afternoon, we drove to Humahuaca. We visit the market, the monument dedicated to the Independence heroes, we played with the children (and not so children) with artificial foam ,talc and water! People was enjoying the feast and the comparsas joined with multicolored flags. It was time to go back to tilcara, to rest till the following day, which would be very long! We knew that day would be very exhausting.. in the moving following comparsas but also in emotions. Saturday was dedicated to unbury the devil of carnival. At Tilcara square, masks and customes appeared in the groups (comparsas) that cross the streets, accompanied by bands of musician with traditional Andean instruments like tarkas, quenas, erkes, sikuris and big drums. In-between music and dancing and offers to Pacha Mama, (mother earth), the devil was picked from inside the pile, where it was buried the previous year. A rain of artificial foam, talc, beer an d other beverages covered the mojon.. the band was playing like crazy, all kind of music. When the celebration ended, and the comparsas departed with the devil, to have lunch and go on partying, we drove to Uquía, where the local unburied would be later in the afternoon. We arrived, and hundred of persons were there, at the bottom of the hill, waiting for the devils to appear.. meanwhile they were dancing and singing with the sound of the musicians playing there..
when they arrived at the mojon, in between hundred of persons happily singing, the carnival was unburied..
We went to visit a small village near Tilcara , named Maimará, “falling star” in aborigine language. One of the highlights is the cemetery and the impressive background it has..
After a good rest we decided to see carnival by night.. people partying, music and invitations..
in this video , you can see how the comparsas begin going to the centre of the city. At 1.45 , a view of the streets, crowded, and then at 2.08 an improvised band, which musicians shared with us.... then at 2.45, you can see a gallery of shops where comparsa was invited..lights, music.. a red tank there full of saratoga (wine and orange juice) ..
we were there till late so, it was time to leave to prepare for next day! 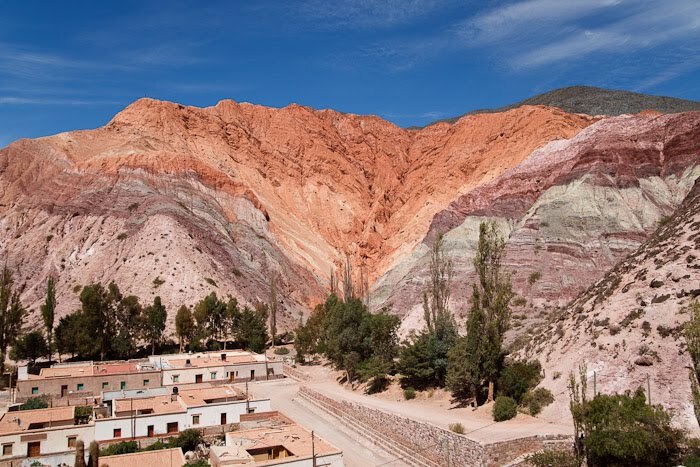 On the southern part of the Puna at 3350 m sea level lie more than 12.000 hectares of salty clay. we came back to to see how were the comparsas doing at Purmamarca, a beautiful small village at la Quebrada de Humahuaca, near Tilcara.. its name means "village in virgin land" and it is famous because of the mountain of the seven colours..
We entered the village but we saw nothing carnival's special except some festive parrots..
there were copleros, dancers, a band of modern musicians...some old ladies drinking "saratoga", a beverage with orange juice but also alcoholic additions! would you like to see them dance? Pozuelos is a nature reserve with thousands of Andean flamingos (Phoenicoparrus andinus). Its habitats are the salt-water lagoons of the Andean altiplano where they build mud nests and eat minuscule crustaceans. We went to Purmamarca, to make a visit to its market, one of the most important (and cheaper) of all la Quebrada. A long road, 40 minutes walking, called de los Colorados, with some shadowy stops at its beginning.. and a breathtaking, wonderful view while doing it.. pleanty of panoramic photos to be done there..
We went back to Tilcara and heard some so typical music, same to previous comparsas but with more flutes... we follow the sound and an elegant devil welcomed us..
would you like to join us and them here? We went to Juella to see the small village and to try to find the so nice musicians we had hear the previous day.. But first, we went to visit the pucará there, a huge fortress in old times, established on a plateau, high one, beside the river. It sis aid it had 10.000 inhabitants. Nowadays can be seen the rest of walls, and sacred places, surrounded by cardones (cactus). We were very lucky, as there were no rains over-flooding the river and blocking the road! We then descended and cross the river back to the village ... and were lucky, as we found much more than the musicians!.. The comparsa was there, invited to a house and we arrived just in time to see them. it was very special time..the village is small, and there were only the inhabitants, no tourist, just us.. But a hard rain began..people went inside the house and we were kindly invited to enter with them!